If you are in Cambodia then you will note that the British Embassy in Phnom Penh, Cambodia is located close to TNT Express in the capital city. This Embassy issues visitors visas to Cambodians, spouse visas, fiancee visas and also will issue you a new British passport if you had your passport stolen while in Cambodia. The embassy has set hours for consular services and this is listed below. Also note their email address if you are not in Phnom Penh and need answers before coming. The telephone number, street address and a map has been added to help find the British Embassy. If you are in the region you can also ask at the British Embassy in Thailand or the British Embassy in Hanoi. If you’re in Cambodia and you urgently need help (eg if you’ve been attacked, arrested or there has been a death), call +855 23 427 124. Note that the public holidays for Cambodia do change from time to time. The listing of public holidays in Cambodia includes those that the British embassy would celebrate and close their offices during this time. You will note that Cambodia is not a Christian country but Christmas Day and boxing day as an example it is closed for consular services. Check with the embassy for any other dates. 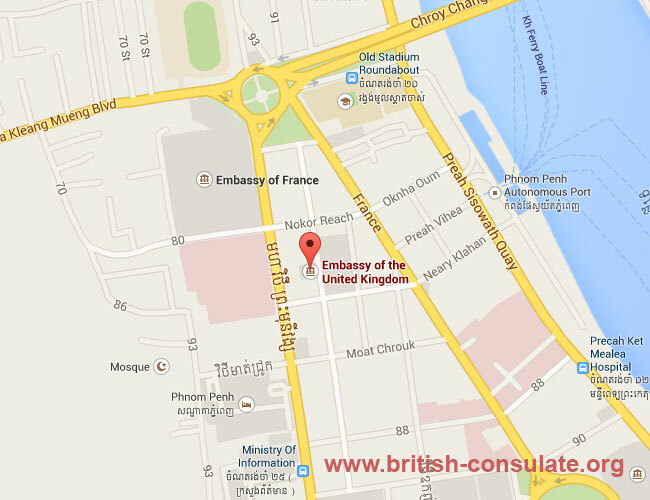 The British Embassy in Phnom Penh has the following times when it comes to the issuance of a British visa. Note that the visitor visa for the UK isd the fastest and can take as little as 10 days however the non-immigrant visas do take much longer. Speak to the staff at the British Embassy in Cambodia for more information. Note that the National Day of Cambodia is on the 9th November. This was not included in the official calender of the embassy in Cambodia.